Mass begins at 10:30 AM. ​We are making a change to the Procession after Mass this year—we are going to pray the Litany of Saints during the procession. We will be using the standard Litany of Saints format with a little twist—we are going to add the Patron Saints of the Italian towns of our ancestors. For example, my grandfather’s family came from the town of Noci, in the Bari Province, in the Puglia Region of Italy—the Patron Saint of Noci is St. Rocco. St. Rocco is not normally in the Litany of Saints, but we will add him to the Festa’s. We want to add your ancestors’ Patron Saints as well—so we need to collect your family data to add to the Litany of Saints. Please provide as much of the following information as possible. If you are unsure of some info, leave it blank and we’ll try to research it. The “person requesting” and their “email address” will NOT be posted on the website or procession handout—this information will only be used to contact you if we have any questions. 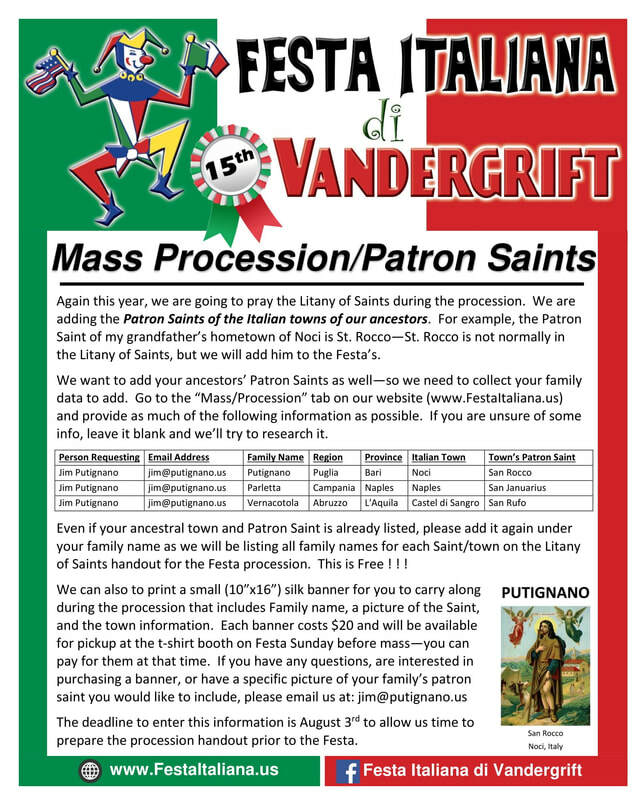 Even if your ancestral town and Patron Saint is already listed, please add it again under your family name as we will be listing the family names for each Saint/town on the Litany of Saints handout for the Festa procession. THE SPREADSHEET WILL BE UPDATED WEEKLY ONCE THE INFORMATION ENTERED IS REVIEWED. Please enter as much information as you know.